The Central Coast American Viticultural Area (AVA) stretches roughly 250 miles along the coastline of California, from San Francisco County in the north to Santa Barbara County in the south, averaging about 25 miles in width. A very large AVA, the Central Coast encompasses approximately four million acres, of which 90,300 acres are planted to winegrapes. The region produces almost 15 percent of the state’s total winegrape production and is home to about 360 wineries. An area further south, loosely called the Southern California Region, includes five AVAs that cover 267,500 acres in Los Angeles, Riverside, San Bernardino and San Diego counties. American Viticultural Areas are to appellations of origin like grapes are to fruit. AVAs are delimited grapegrowing areas distinguishable by geographic, climatic and historic features, and the boundaries have been delineated in a petition filed and accepted by the federal government. In size, AVAs range from extremely small to extremely large. AVAs are one kind of appellation, but not all appellations are AVAs. An appellation can also be a political designation, such as the name of a country, a state or states, or a county or counties within a state. More information on AVAs and appellations can be found on the Wine Institute website at www.wineinstitute.org/ava/index.html. Central Coast AVA — San Francisco Bay The northern section of the Central Coast AVA includes: Alameda, Contra Costa, Santa Clara, San Francisco, San Mateo and Santa Cruz counties. There are around 5,000 acres of planted vineyards and more than 100 wineries, ranging from small start-ups to historic leaders of the California wine industry. Chardonnay is prominent with 1,300 acres. The most widely planted red winegrapes are Cabernet Sauvignon and Merlot with roughly 700 acres of each variety. Approximately one percent of the total state wine grape production comes from this district. Cooled by the San Francisco Bay and the Pacific Ocean, the warm days and cool nights provide classic grape growing conditions. The primary soil type is well-drained gravel that reduces vigor in the vines and increases flavor concentration in the fruit. Central Coast AVA — Monterey and San BenitoContinuing south along the Central Coast AVA, Monterey and San Benito counties are the next two areas. Known for the rugged beauty of Big Sur, the charm of Carmel and the lore of Pebble Beach, Monterey County is also home to 38,200 acres of wine grapes and about 75 wineries and growers. San Bernabe, the world’s largest contiguous vineyard at over 8,700 acres, is also located in the area. Chardonnay is a very important variety, comprising 43 percent of total grape acreage with 17,350 acres planted. The second largest variety is Merlot with 6,300 acres planted in the warmer, southern area of the appellation. 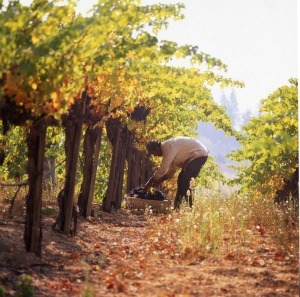 There are roughly 2,800 acres of winegrapes planted in San Benito County and eight wineries. Together the two counties account for 7.7 percent of the total state winegrape crush. The climate of Monterey County reflects the cooling influence of the Monterey Bay and lack of abundant rainfall. There are enough warm days to ripen the grapes, however the marine influence predominates. Due to the cool growing conditions, harvest is typically two weeks later than other regions, allowing for a long season and slow fruit maturation. The steep slopes and rolling hills provide good drainage, and Monterey soil temperatures are cooler than other parts of the state, limiting crop size. Central Coast AVA — San Luis Obispo and Santa BarbaraSan Luis Obispo and Santa Barbara counties make up the southernmost district of the Central Coast AVA. There are 26,400 acres of wine grapes planted in San Luis Obispo County and 17,900 acres planted in Santa Barbara County, totaling more than 44,000 acres. Together they make up 6.3 percent of the total state winegrape crush. The number one wine grape variety in San Luis Obispo County is Cabernet Sauvignon with 8,600 acres. Merlot is second with 4,000 acres. There are about 110 wineries in the County. In Santa Barbara County, Chardonnay is the predominant grape with 8,000 acres, and Pinot Noir follows with 2,900 acres. There are almost 90 wineries. The city of Paso Robles, situated 20 miles inland from the Pacific Ocean, is in San Luis Obispo County, halfway between San Francisco and Los Angeles. The area is characterized by warm, clear days, generally unencumbered by clouds, fog or severe winds. Nighttime temperatures drop by approximately 40 degrees, cooled by a marine layer that moves over the region after sunset. Proximity to the ocean, orientation of the numerous canyons and valleys, and varying elevations produce diverse macroclimates, allowing production of both cool and warm loving winegrape varieties. There are four general soil associations, primarily formed from the weathering of granite, serpentine, shale and sandstone. In Santa Barbara County, the north-south coastal range of mountains abruptly turns to run almost east-west for 50 miles, framing the valleys in a unique transit to the Pacific Ocean. This is the only stretch of land from Alaska to Cape Horn constituting an east-west traverse. The unique topography allows the flow of fog and ocean breezes to shape distinct microclimates and makes the region one of the coolest viticultural areas in California. However, warmer daytime temperatures in the inland areas allow a wide variety of winegrapes to be grown. Terrain and climates vary widely, from steep, wind-swept hillsides to rolling inland valley vineyards where summer temperatures often reach the century mark. Southern California RegionThe Southern California Region extends from the Malibu-Newton Canyon AVA, 850 acres, north of the city of Los Angeles to the southern border of California below the city of San Diego. Among the five AVAs located in the region, the South Coast is the largest with an area totaling 115,200 acres. Cucamonga Valley contains 109,400 acres of land. Temecula comprises about 33,000 acres and San Pasqual Valley around 9,000 acres. 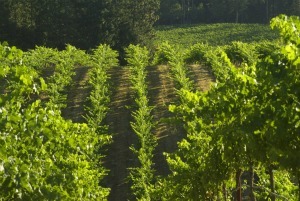 The region has about 44 wineries. The coastal areas of California are highly prized winegrape growing regions due to their proximity to the cooling influence of the Pacific Ocean and a wide diversity of soils and topography. This long stretch of land is ideal for the cultivation of classic wine grape varieties and the production of world-class wines. Editor's note: Links to the websites of wineries in these areas, as well as links to hundreds of lodging and dining options, can be found at Taste California Travel's Resource Directory. Tchelistcheff monument now at BV. Photo by Creative Common.André Tchelistcheff may have been the most significant figure in the history of American wine. The Russian born and French trained winemaker immigrated to the United States in 1938, beginning a lifelong association with Beaulieu Vineyard (BV). Though he died eight years ago at age 92, friends and colleagues said his presence was still felt at a tribute held in his honor Monday evening, the 5th of August at the Culinary Institute of America at Greystone in St. Helena, California. Dubbed “the Maestro” by the late Beaulieu executive Legh Knowles, Tchelistcheff served continuously as BV’s winemaker from 1938 to 1973. After some years consulting for other American wineries he returned to conclude his career at Beaulieu Vineyard where he served as mentor to Joel Aiken, now vice president of winemaking for the firm. Aiken and André’s widow, Dorothy, provided one of the celebration’s many highlights when they unveiled a bronze statue of the legendary winemaker. The likeness will be on display for a year-and-a-half at the culinary school before it is moved a few miles southward to its permanent home at Beaulieu Vineyard in Rutherford. It was created by noted sculptor William Behrends, whose spot-on bronze of Willie Mays concluding his swing greets baseball fans arriving at the San Francisco Giants’ Pac Bell Park. Following the statue’s unveiling, 125 guests ascended the stairs to partake in a spectacular Barrel Room dinner and enjoy music provided by the Napa Valley Symphony and performers from the Russian National Orchestra and the San Francisco Opera company. Though Beaulieu is probably best known for its Cabernet Sauvignon wines, in particular the Georges de Latour Private Reserve, the winery has also made wonderful Pinot Noirs and that variety may have been André Tchelistcheff’s favorite. The occasion was chosen as an appropriate time for the debut of the 2000 Maestro Pinot Noir, which was one of eight wines served during the evening. Andre draws red wine sample from barrel. As master of ceromonies for the evening, Joel Aiken introduced a parade of luminaries who spoke of their own memories of the beloved André Tchelistcheff. John DeLuca of the California Wine Institute recalled cementing an early friendship with him, in part because of his State Department background when he had served in the Soviet Union in the late 1950’s and early 1960’s. Congressman Mike Thompson remembered the high regard his mother had for André during the years she worked as his secretary at BV. Several of California’s best winemakers from more recent generations including Marco Capelli, Michael Martini, Allison Green Doran, Jill Davis Metzger and Rob Davis, spoke warmly of the nurturing presence André Tchelistcheff had on their careers. Two said that, had it not been for his influence, they wouldn’t have continued their fledging careers as winemakers. About halfway through the evening a colleague across the dinner table from me commented, “it really doesn’t get any better than this.” At that moment I think he was referring to the food and the wine, but the remark would have been fair comment about any and all aspects of the celebration. It was a very special time. Nothing less would have been appropriate. Editor's Note: A link to the website of Beaulieu Vineyard, as well as links to all the other Napa Valley wineries, will be found in Taste California Travel's Resource Directory. Also in the Directory as links to hundreds of lodging and dining options in the North Coast region. They start to gather in the darkness. It’s still a little chilly and most are wearing light jackets or wool plaid overshirts. Later they will peel these off and work in tee-shirts. Merlot vines on rolling hills of Bancroft Vineyard. Photo by Chuck O'Rear. Bancroft Vineyard is on the top of Howell Mountain a few miles to the east of St. Helena in the heart of the Napa Valley. Here at 1800 feet elevation it’s usually cooler in the morning than on the valley floor. Simon, Ruben and Ignacio are among the first out of the bunkhouse. A few minutes later Leopoldo—“Polo”—joins them. These men live at the vineyard pretty much year ‘round. They have families in Mexico they haven’t seen since they came up in January to begin the pruning. Within a week after harvest is completed they will be on the way back to El Llano, their home in Michoacan. It’s a difficult life and they work hard for their six to eight dollars an hour wages. At home they might make that for a whole day—when they could find work. Headlights coming up the drive announce the arrival of more pickers. Most of them are from Mexico, but are living in the wine country now. Two crews will be working today with about 10 pickers each. Gringos don’t pick grapes. Oh, they can and sometimes do just for the experience or to augment the Mexicans’ work, but the fact is, they’re not very good at it. There will be others working today, men and women without Latin surnames who will drive tractors, help pickers dump bins of grapes into the gondolas, and remove “MOG” (material other than grapes). Everybody pretty much knows what the group is going to do and what his role in the day’s activities will be, but there is an air of anticipation; an excitement and maybe a little tension. The feeling could be likened to the feeling shortly before kickoff of a football game or backstage just before the curtain goes up. Joaquin Villanueva, the foreman, confers with vineyard manager Jon Seibel and then speaks to the pickers in Spanish. There is the sound of machinery everywhere. Two Ford pickup trucks leave the staging area, taking the pickers out to the vineyard. Four Kubota diesel tractors leave, too, pulling empty blue gondolas on the low trailers behind them. Most farm work is done for wages, but this is different. Harvest means piece work and the chance to earn $100—maybe $150 a day. Each person shares evenly in the money his crew will earn today. The first half hour or so, picking is done in only a half-light and care must be taken not to include any clusters of “second crop”—grapes that begin their growth after the majority do. These may look mature, but they’re not. Their characteristic shine or slight luminescence can’t easily be picked out until the sun gets over the pine trees adjacent the vineyard. Now and for the next couple of hours the packers are literally running. They scurry from vine to vine, looping around each other until their trays are filled, then run to the gondola which usually precedes them down the row about twenty to thirty yards ahead. Later, fatigue will slow them a bit, but now they run toward the gondola, usually dumping their bins themselves if they are working in the same row as the tractor. If they’re in a row adjacent, they’ll hand the bins to helpers who attend the tractor and gondola—under the vines or over them. The helpers this day are tall Anglos who can usually take the tray over the vines more easily than they can bend to the level where the Mexicans are to pick the tray up. Occasionally, Arriba! is heard and a picker sends his bin flying over the vines and right into the goldola. We retrieve the empty bin and send it back at him. This throwing of the bin may be thought to conserve time and, when it’s done accurately, probably does. There’s a macho element to it, though, and I can’t deny that for men who weigh maybe 130 pounds to press 40 to 50 pounds of grapes overhad then fling them over the vines and directly into the gondola is pretty impressive athletically. As the day warms, this practice wanes as does the running. Picking is hard work, but the pay is good. Picking fast and picking cleanly is imperative, but is not easy to do. Leaves are sometimes cut along with grape clusters and must be minimized before the load goes to the winery. The tall helpers stoop over the gondolas, working furiously to remove leaves and anything else that’s not grapes. Each gondola holds about two tons and as one fills, it must leave the vineyard row and be replaced immediately by another tractor with empty gondola. 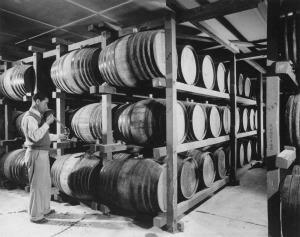 Filling each gondola takes about 45 minutes and care must be taken to periodically level the load and gently pack down the grapes, otherwise the gondola will overflow without acquiring its required two tons. Whether picking or packing, handling ripe grapes gets the hands sticky. Loaders and packers will rinse off occasionally in water from the orange cylinder kept on or near each tractor. Pickers will use the same water source for drinking but don’t seem to have time to wash off. When loaded, the tractor and gondola will be driven back to the area in front of the bunkhouse and shop where Javier will weigh the grapes and load them onto a large flatbed trailer. Later, this trailer will be towed down eight miles of steep and windy road to Beringer. Around noon people begin to wonder if we are close to finishing. Today, Beringer Winemaster Ed Sbragia says he wants 24 tons. The pickers are tired, but they’d rather continue deep into the afternoon and are disappointed to find that the winery can only accommodate the 12 gondolas of grapes today. Disappointment is tempered by the exhilaration of knowing that relaxation is just a few minutes away as some ride in from the vineyard clinging to the last full gondolas, others standing in the back of a stake-bed pickup. A few minutes to rinse their picking bins and themselves and then quickly to the iced tub of sodas and Budweiser. About seven hours ago I thought the atmosphere resembled that preceding an athletic contest and now, sitting under a tree and savoring the second beer, I feel like I used to when peeling off tape in a locker room and looking forward to a shower. Fifty yards to the north and out in the sun is the big trailer with 12 gondolas of our grapes. Better to stay away from them now as the bees are attracted to their sweet stickiness. It’s nice to relax and gaze at them. They’re a very tangible record of our labors today. In an hour they’ll be gone and in two hours they’ll begin to be dumped into a stemmer/crusher at Beringer and its stainless steel augur will continue the work of helping fruit reach its highest expression. And tomorrow before dawn we’ll begin again. Editor's note: Links to websites of all the Napa Valley wineries, as well as hundreds of lodging and dining options in the North Coast, are found at Taste California Travel's Resource Directory.